Can I use multiple email addresses with my Trulia profile? Help! I’m not receiving any lead emails. How far back is the history of leads in My Leads? Where are my ratings displayed? Can I add my company logo to my listing? How do I send a client listing report? What if I want to change my current subscription? When will I be billed for my subscriptions? What is Trulia's refund policy? You qualify for the Million Dollar Pipeline Program! Million Dollar Pipeline Program offers expert real estate coaching and resources for you to excel in lead generation, lead engagement, and run your business like a CEO. 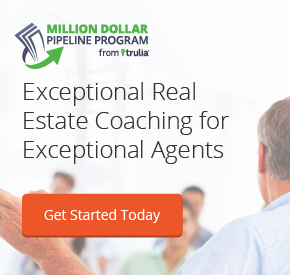 Million Dollar Pipeline Program offers expert coaching and strategy for real estate agents to set, achieve, and exceed their transaction goals. Agents that go through the program achieve excellence through learning how to build a steady pipeline, convert leads into clients, and a CEO track to set goals, create a business plan, and ulti- mately scale their successes through proven techniques. Interested in joining us now? The Million Dollar Pipeline Program is an exclusive program developed by Market Leader that teaches agents to generate and engage enough leads to consistently meet and exceed their transaction goals. The program offers live weekly coaching webinars focused on building success using the Market Leader Professional system.